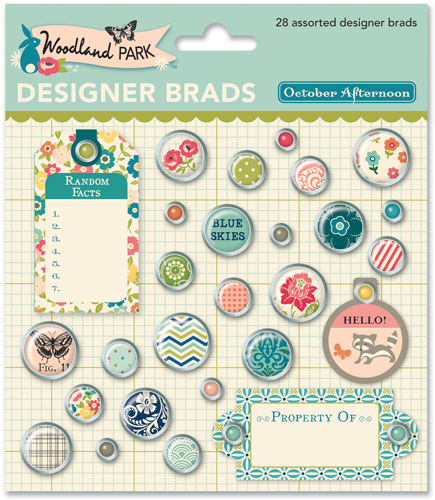 the OA Woodland Park line is filled with fun papers and embellies for any-day scrapping or outdoor fun. i love the gorgeous patterns and colors in the line and the "B" sides are just as gorgeous too. The OA Woodland Park line has twelve double-sided pp, 8 x 8 pp pad, printed chip shapes, 12 x 12 shape stickers, printed chip shape (banner), word stickers, miscellany, label stickers, mini market stickers, 12 x 12 alpha stickers, sticky keys, journal cards, flower sacks, little flyers, tin pins, buttons, decorative brads, tid bits, here and now album & chapter pages, doo dads, sprinklers, washi tape, wrap pack and stamps. as part of the hop, i will be giving away a set of OA Woodland Park Brads pictured below. to be eligible to win this set of brads, leave a comment on this post. Comments will be left open until Monday, July 16th. i wanted to stitch the word "play" negative on the front of the cover, so i traced, lightly, with pencil onto the page, then stitched the tracing, erased the pencil and added some dimension to the word. 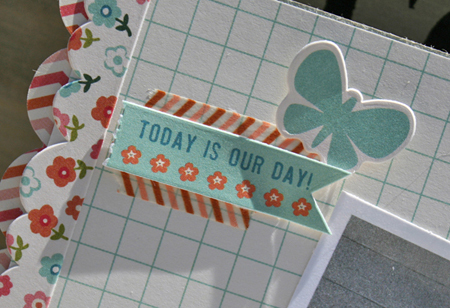 it's fun to stitch a clear pocket over the journal tags and fill them with fun confetti of all kinds. 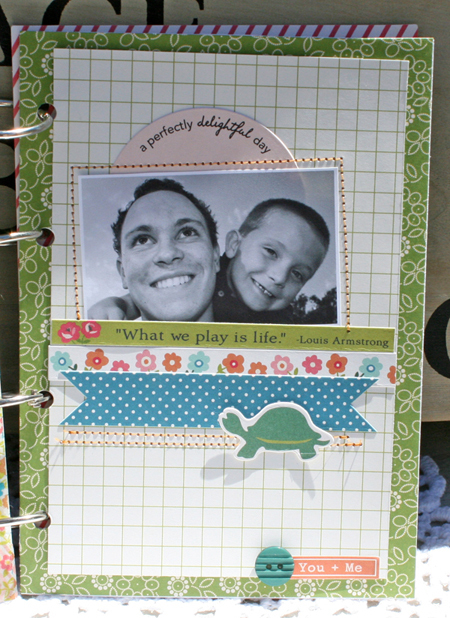 i also cut one of the journal tags in half and adhered the pieces to both sides of my picture. so IF you want a chance to win this collection, make sure to stop by the OA BLOG and leave a comment. so much love to you!! Beautiful mimi album. Every element you added is so perfect and pretty, also love the butterflies and stitching. Thanks for sharing. I absolutely love your mini album. I am a big fan of mini books. Thanks for a chance to win. Wow Danni, this is stunning. Love all your little details. This is so adorable! I love all of the stitching and the embellies too! Wowwwwwwwwwwww!! Your mini is GORGEOUS!! 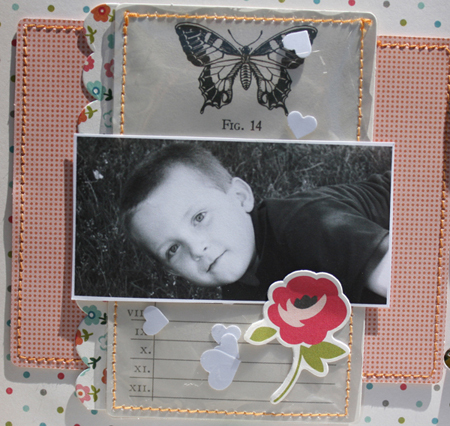 I love love love all the photos, the butterflies and loving the stitching in the cover of the books title!!!!! Absolutely GORGEOUS album!!! LOVE it!!! Your mini is amazing! Lots of great details, thanks for sharing it! love all the great stickers! I love your mini album. It is amazing. Thanks for sharing it and the chance to win! Love all the stitching you did on your mini! Beautiful! Love this album. I love the stitching and those bunny tails! THanks for sharing. Danni, this ROCKS! Wow! I love seeing you do a mini--you should most definitely do more! Love the minibook! So many great details! Thanks for the chance! 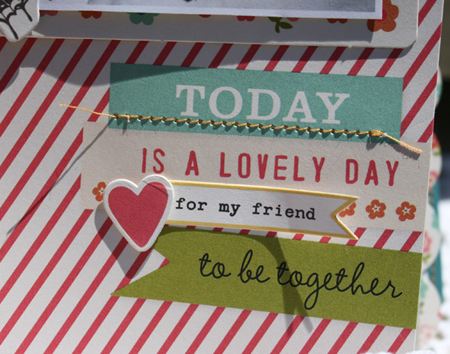 love your project and the new Woodland collection!!!!! Loving the OA mini books! Thanks for the chance! Your mini album is so cute!!! I LOVE IT! Your mini album is so gorgeous! I love the embellies and stitching, you did a great job! What a fantastic mini Danni! I love all the little bits and pieces! Your stitching is flawless! How do you do that? Adorable mini :) Thanks for the chance to win! Love your mini album and those brads. Thanks for a chance to win them. Your mini album is so precious. 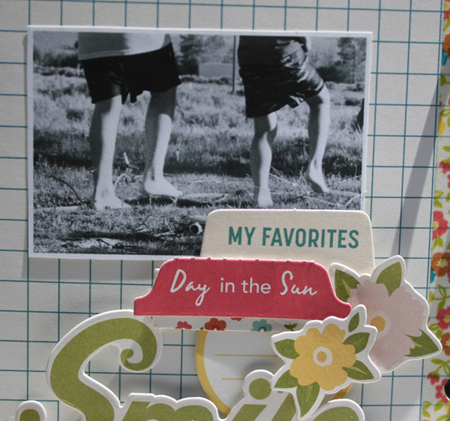 I love how you captured the essence of a special summer day out. Great use of the captions and pretty embellies to accent each photo. It will mean so much when you look it over, if it's next winter on a cold day or years from now when the children are grown. 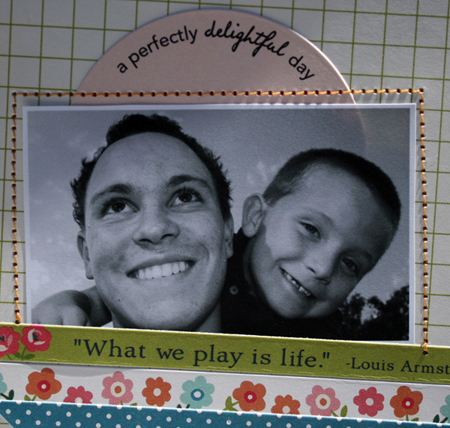 A beautiful keepsake! What a lovely mini album! 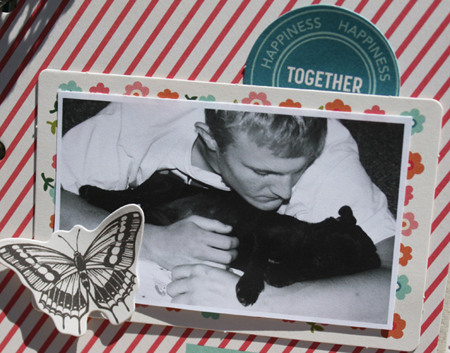 The black and white pictures and the lovely colors of the collection go perfectly well together! Thanks for sharing the mini album with us! It sure is great inspiration! This mini is adorable! LOVE all the stitching and that little pocket on the front. 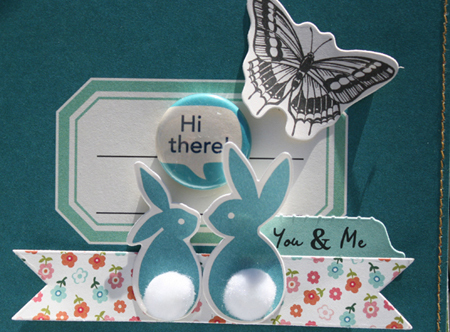 The bunny tails are so cute, such great embellishments and elements! I love everything about your mini!! Beautiful project as always! I've admired your work for years and this project is no exception! Beautiful mini! Love the stitching, the bunny pom pom tails, the butterflies, all of it! Outstanding work! LOVE the stitching you did on the cover! You are one patient woman :) And I absolutely love brads! This is fabulous. The bunny butts are my favorite! Love that! And I love brads. I would love to win this! Thanks Danni! love your mini book, that for your inspiration. I always love whatever you make! 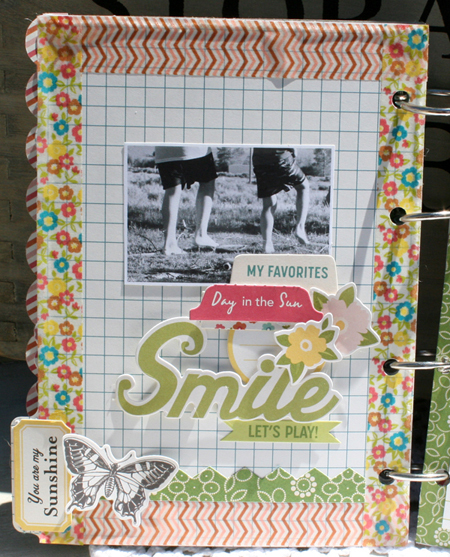 love your here & now mini album - love the pops of colors and extras!! love your here & now mini album! love all the pops of color and all the details - you did an awesome job!! I love your projects, but the bunny pom-pon tails really brought a smile to my face...I adore this new line, so I can't wait to see it hit stores! I love the book - just the right size! Thanks for the inspiration! That mini album is gorgeous!!!!! You are so talented! Thanks for sharing. love the giveaway too. That is such a beautiful mini book. Thanks for showing so many wonderful projects. My favorites have animals on them!!!! Love your album. Very nice! TFS! beautiful line and your album looks gorgeous!!! LOVE this new line and your mini album is amazing! Such an amazing mini album! 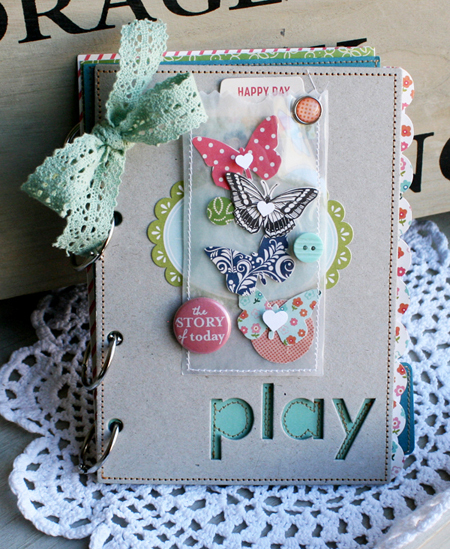 This mini book is absolutely FABULOUS!!! I'm really LOVING this collection!!! Your mini album is absolutely adorable! Thanks for the chance to win something! 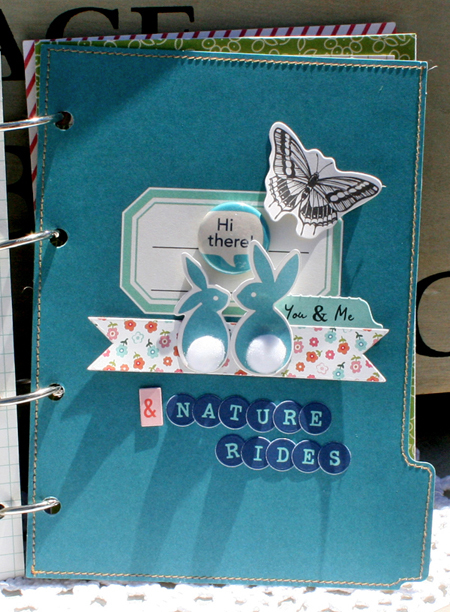 Great details and coordinating in your mini-album. This line has A LOT to "Play" with! What a GREAT mini!!! I love it! Thank you for sharing! I'm so in love with the peacock in this collection!! Super cute mini! Love this collection! I love how you stitched in the negative space. That mini is adorable! I love this collection. I love your mini!! Gorgeous! The colors are so fun in this new line! Your book is beautiful! Love what you've done with the mini! The stitching adds such a nice finishing touch. Thanks for a chance to win! The little clear bag is too adorable. I need some. What a great project. You must be very happy with how it turned out! What a great collection - Love what you did with it! OMG..That is a really cute mini album!! 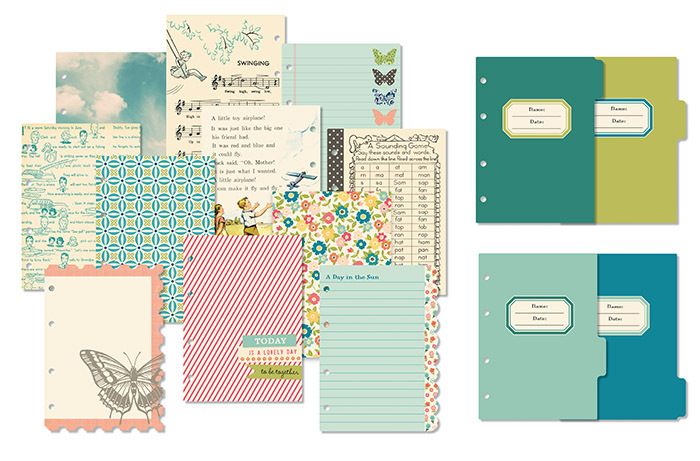 I'm so excited for this collection to come out..I love the colors and the designs on the pattern paper..I just can't wait!! wow wow wow I totally love this...amazing detail on each page and love the entire design...amazing creativity...thanks for sharing..
Great album! I like so may details and dimension! Your album is so adorable! Love the butterflies. Thanks for sharing! Ah, I love your album! Lovely. 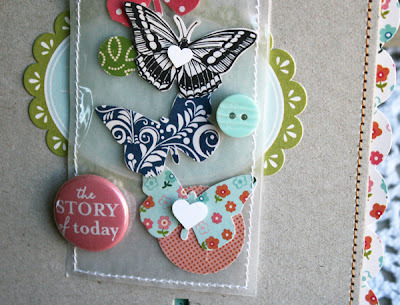 I love all of the embellishments and papers. Your album is rockin'! Love love love it! The brads are so amazing!! Oh my gosh your album is gorgeous!! I love those beautiful brads! Gorgeous album! I've never made a mini album, but this might just inspire me to take the plunge. I especially like all your stitching detail, it adds so much depth and interest to the pages. Those bunnies are just too cute! And the brads look wonderful. Thanks for the chance to win! I love that you decided to create a mini! I saw the Here and Now pages on the OA blog, but it's hard to tell what they really look like. You really showed them off in style! (Cotton-tailed bunnies? How cute!) Fabulous project! LOVE the album! SO cute!!! that mini is just too cute; love the colors and those fluffy bunny tails! What a pretty mini album! I especially love the cotton tailed bunnies. Thanks for the chance to win. Sweeeeeet Mini!!! That is some amazing sewing you did on the letters!! What a great album! Love it! Love the brads--can't wait for them! so so sweet dani!! I love the composition and all you fantastic details on this mini!! delicious!! WOW!!! Love how you used so many different items from the collection. Your album is amazing, and the cover is picture perfect! 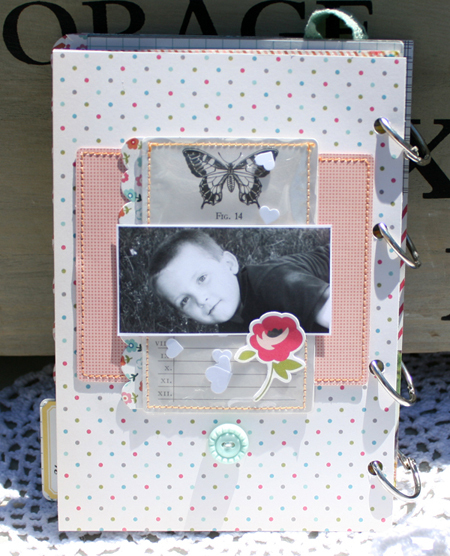 I love your use of vellum and all the stitching throughout the entire album. Your creativity and attention to detail is wonderful! Thanks for the inspiration! Very cute album of happy times. Lovely project, thanks for the inspiration! Love your album...it is wonderful!! :) Thanks for the chance to win some OA. This album is awesome! 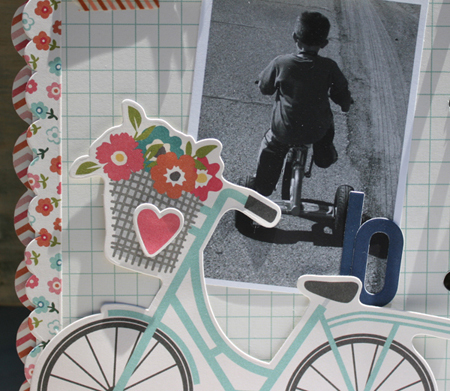 Love the colors and how you incorporated all of the tiny details along each page. Fantastic! I love you album! It's amazing!!! And these brands are wonderful! Thank you for this great chance. Love your mini, Danni!!! You make such cute projects! The mini is awesome!! Love the cute elements you included like the bunny tail. I love the cover page. Thanks for the inspiration. Everything is insanely pretty o.o I'm speechless! That is a wonderful album!!! Beautiful designing that you did on it!! And I love all those OA elements: they look so fun to play with!! Whaou... super mini album !!!! Thanks for sharing this beautiful album, love the colors and the design. This little book is just perfect. Now I want this collection to make my own book. This is the sweetest mini! I am the ult. Mini addict & this just makes me that more excited to get a chance to work w/this awesome collection! Your mini album is stunning! Thanks for sharing the OA collection - I am making my wishlist now! Your album is unbelievably cute!! 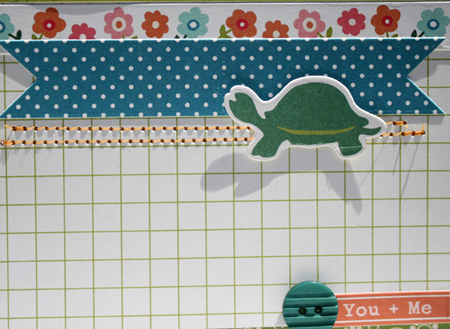 I love the pieces of washi tape against the grid paper. And all of the chipboard pieces! Saving it for future inspiration! Your mini album is beautiful. Love the extra stitching on the cover! Thanks for the inspiration! Gorgeous Mini Album! =) Lovin' the bunnies saying "hi there"
Ooooooh! Those brads are awesome and that mini album is gorgeous! Great job Danni! first time to see the hear and now in a project i liked the mini album. What an adorable project! I agree about those bunnies - they are so cute! Thanks for sharing and for the chance to win! Love every detail of your gorgeous album! Amazing project. I love your attention to details shown in your stitching, the bunny tails, etc. Love your mini album. Can't wait to get some of this stuff. Love the stuff. Thanks for the chance to win! I love what you did with the title "play" on the album cover, brilliant idea!! SWOON! 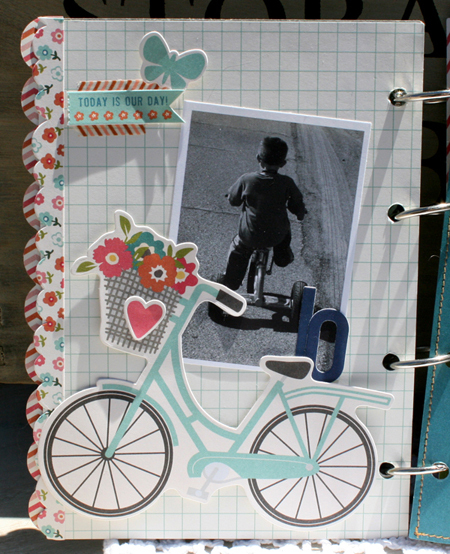 I'm in love with your cute little album! oh my goodness! I love the brads! And your mini album. Would love to win! Awwww. What an adorable mini you have. I love the Pom poms on the bunny super cute. What a great mini album! Really love how you've used the elements here. Thanks for the chance to win! Danni, i love your blog so much! You always inspire me to use my sewing machine! I need one of those OA albums....they are so cool! so beautiful - I love the whimsy without being too cutesy. gorgeous album! 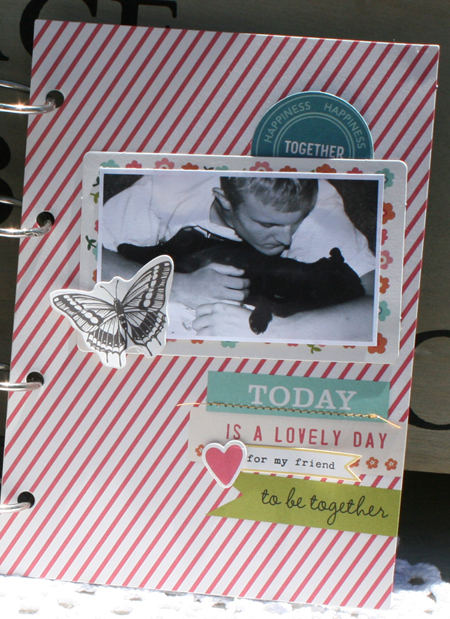 Hi Danni - What a perfectly yummy mini album you've made with this delightful new OA line. I am already smitten with the entire line, and the floral washi tape has my heart rate up for sure!! Thanks for sharing your pretty album. You know how I love your minis!!!! This are just gorgeous and the details so pretty!!! I´m blown away, totally, of your talent! I love OA so this cure brads would be loved on my scrapdesk;) Hugs! These cards are just too cute. I love the bicycle one and the way you used the word play and stitched around it, very creative. THanks for sharing. I love that you gave those funny little bunnies FUZZY cottontails! I totally enjoyed your mini-book. Would love to use those brads! I super love your mini book!! And those brads are ADORABLE! loving the mini and the fact that you captured photos from different angles...and yes, the bunnies are super adorable! what a fab little album and a lovely collection. Adorable album. Love the stitched details. Just love the butterflies on the cover! And like all the others I think the bunnies are lovely too. This album is absolutely beautiful... love all you did here. And the collection is really great! Thank you for the chance to win! Those bunnies are way too cute. 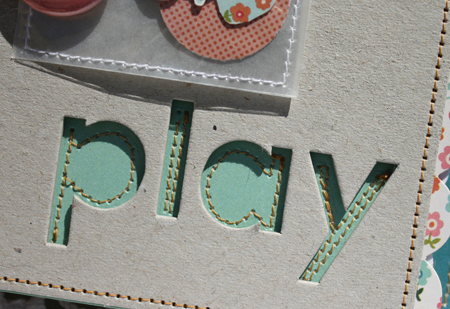 I love how you stitched inside the word "play" - so unique! love this album. You're so talented. thanks for sharing with us. Love your mini album. Love this new collection from OA. Wonderful colors and love all the embellishments. Thanks for sharing and the chance to win. Oh WOW! What a beautiful inspiring album, love your great details and yes those brads are delicious! Your mini album is gorgeous. 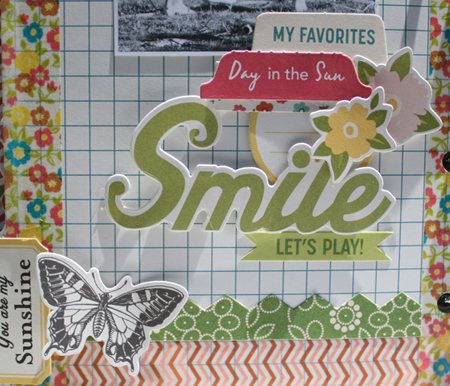 Love all the colors in this collection and the embellishments have such a great selection to choose from. Thanks for the chance to win some. Your mini album is so sweet! Thanks for the chance to win such lovely brads! Darling mini album! Love the cute bunnies and everything. Love you mini album! And I'd love to win these sweet brads! That is the most adorable mini album! I love the stitching on the cover and those bunnies are just too cute! I really love this collection. Oh Danni, your projects never fail to leave me somewhat speechless. How cute is that line anyway?! It would be perfect for all our summer pix.